AMAR’s President, Baroness Nicholson of Winterbourne, headed a delegation of senior international staff to Southern Iraq in early October. The Baroness, AMAR ICF CEO Richard Crow, AMAR U.S. Trustee Margaret Casscells-Hamby and Tony Howell, AMAR ICF’s head of infrastructure, visited projects in and around Basra. The delegation reviewed new and ongoing work – witnessing classes and health sessions, visiting sites under construction, meeting staff and speaking with local families. For Margaret Casscells-Hamby, this was her first visit to see AMAR’s work in Iraq. Here, she reflects on her experiences. “Before going to Iraq, I thought we at AMAR were involved mostly with humanitarian aid. By the time I left, I realized that we do far more than this. We build people and institutions from the ground up and are involved in improving so many aspects of daily life. And early start on our first day took us two hours north of Basra to our mobile health care clinic in Al-Thagher. Here we saw how doctors and nurses are helping to tackle the effects of polluted water in the Marshes. The clinic also gave a lesson on cholera prevention strategies. The Community Leader’s humble home was packed with mothers, children and older women who listened closely and waited patiently. 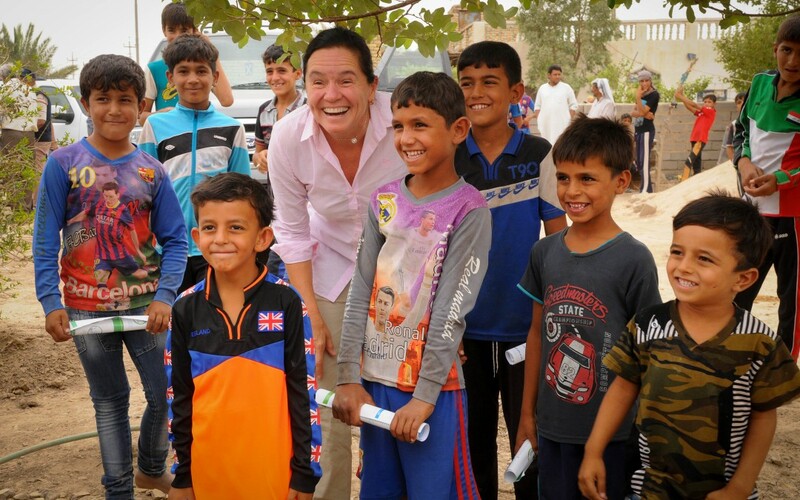 The Shell-AMAR project brings vital healthcare and advice to the most remote parts of Iraq. Before this, families were often forced to walk many miles to the nearest hospital. Outside, young boys were eager to pose for pictures with their AMAR visitors and we loved seeing women there baking bread in their mud oven. We later moved on to see how AMAR’s health education program captivates the attention of pupils, and is delivered by wonderfully talented teachers. We visited Al-Dayer to see Women Health Volunteers training on cholera prevention. This project has had wonderfully positive results in preventing the disease. Last year, we were told, cholera had been a real problem, but this year, there have been no cases reported so far. As we prepared to take a group photograph, a small boy approached me. He was curious and asked me to pick him up, I think so he could look more closely at this strange outsider! It was an incredibly sweet moment. After that, almost all the women wanted to take a picture with me – and their phones were crammed with “selfies”! We then moved on to AMAR’s Al-Nashwa district WHV project. Here they were training the women on how to instruct families on road safety. The ladies demonstrated how parents should hold their children’s hands to cross the street and anywhere where there is traffic. Just imagine a situation where there are no traffic rules, no road signs, no traffic signals, and no road painting. Now imagine little kids trying to cross those streets. The image demonstrates the importance of AMAR’s Road Safety Project. Next we went to see AMAR’s ground-breaking Religious Tolerance Project. Leaders from all sectors of society with a mixture of faiths, all together in one room, discussing peacefully and rationally the meaning of extremism. It gave us hope that soon, just like in the melting pots of the US and UK, Iraqis from all walks of life will be one day be able to coexist in peace. Notably, an Economist magazine reporter accompanied us to this project and was very interested in the efficacy and sustainability aspects of AMAR projects. The world should know that this work is happening and is important. The marvellous Empowering Widows in Iraq Centre in Al-Khora is a prime example of AMAR sustainability and efficacy magic. Seeing women, their daughters, and in one case grand-daughter, learning to read and write touches your heart immediately. In two short months, the ladies went from being completely illiterate to reading and writing on a white board. Meanwhile, the kindergarten attached to the women’s center cleverly provides the income to make the center self-sustaining. Rewaq Fadel is the brains behind this. We should note her dedication and determination to continue all this work while raising two small boys. She is key to our INVEST program. Hats off to her. Keep up the good work!